Walking into the rotunda of the National Museum of Natural History one immediately comes face to face with the Fénykövi Elephant (also affectionately known as Henry). Taken at a glance, the African elephant is impressive and imposing, standing over guests to a tune of 13 feet and 2 inches when measured at the shoulder. 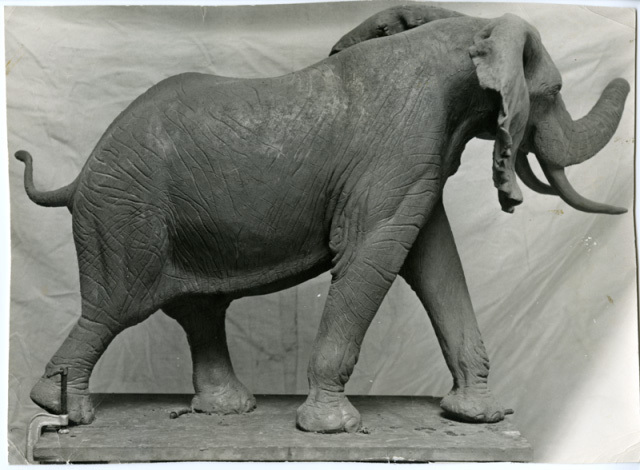 The Fénykövi Elephant, along with the nearly 137 million objects that make up the Smithsonian’s collections, have a story of how they came to call the Smithsonian home. 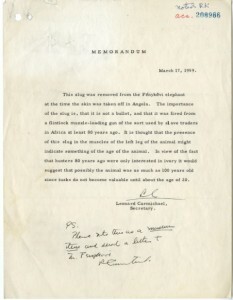 Their stories are contained in the archival and registrarial records that document the Smithsonian’s collections. Record Unit 305 contains records which constitute the official documentation of the national collections and include correspondence with donors, specimen lists, and subsequent correspondence documenting the history of the collections. 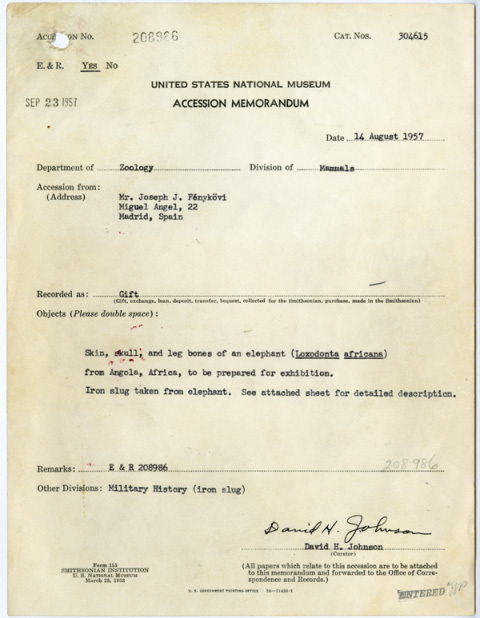 The accession folder for the Fénykövi Elephant contains detailed documentation of the elephant and how it made its way to the Smithsonian. 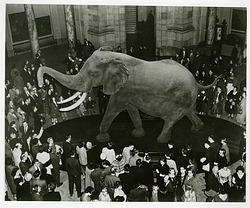 The elephant takes its name from Josef J. Fénykövi, a Hungarian-born engineer and big-game hunter. Fénykövi first discovered the tracks of the extraordinary elephant while hunting rhinoceros in Africa in 1954 in the largely unexplored Cuíto River region of southeastern Angola. The following year he organized a special expedition and on November 13, 1955 tracked the elephant and shot it. The skin alone weighed more than two tons and required a truckload of salt to preserve it as it traveled by truck through hundreds of miles of wilderness to the nearest railroad at Silva Porta. When the skin finally arrived at the Smithsonian in 1956, Smithsonian taxidermists, William L. Brown and Norman N. Deaton, spent the next 16 months preparing the specimen for display, eventually using more than 11000 pounds of clay for the full scale model (see more information in Accession 00-082). 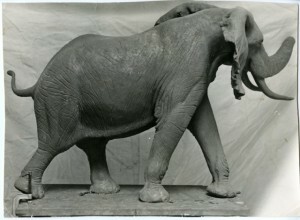 Although the massiveness of the Fénykövi Elephant seems to be its defining characteristic, Smithsonian Secretary Leonard Carmichael made it a point to keep a metal slug found in the muscle of the left leg of the elephant. 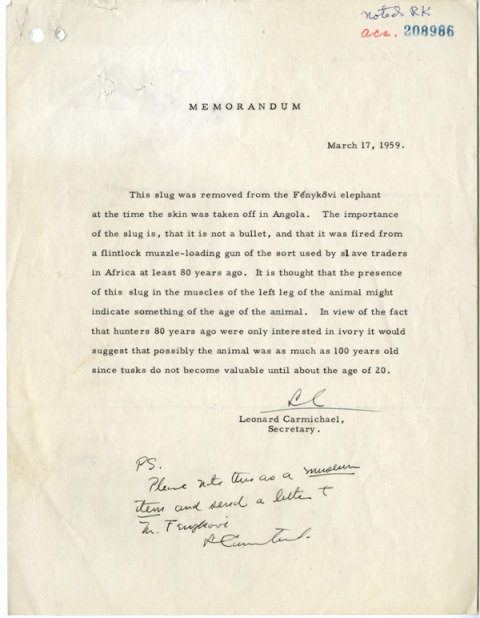 He found that the slug was from a flintlock muzzle-loading gun of the sort used by slave traders in Africa in the late 19th century which placed the age of the elephant to be nearly 100 years old. Huge and old or small and new, the Smithsonian cares for a plethora of objects, artworks, scientific specimens, and archival materials. 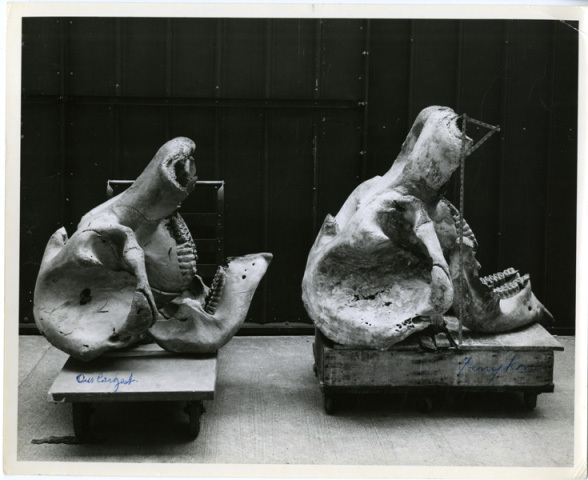 The diversity that defines the Smithsonian’s collections is documented in the registrars’ offices of Smithsonian museums and in the collections of the Smithsonian Institution Archives. These records provide the context within which to understand the importance of a particular museum object and why it was selected to become part of the Smithsonian’s collections. For more information about the National Museum of Natural History please visit their website. Additionally, the museum is celebrating its 100th Anniversary with the exhibition, "Celebrating 100 Years at the National Museum of Natural History", for more information click here.